Las Vegas – UFC® heads to Wichita, Kan. for the first time in the promotion’s history and brings with it a showcase matchup in the heavyweight division. Recent title challenger and No.2-ranked Derrick Lewis looks to re-insert himself into the championship conversation by landing another signature KO against a former UFC heavyweight champion and fellow knockout artist No.7-ranked Junior Dos Santos. UFC FIGHT NIGHT ON ESPN+®: LEWIS vs. DOS SANTOS will stream live from INTRUST Bank Arena exclusively on ESPN+ at 7 p.m. CT/8 p.m. ET on Saturday, March 9, with the ESPN+ prelims kicking off the evening at 4 p.m. CT/5 p.m. ET. Doors open at 3 p.m. CT/4 p.m. ET. All UFC live events on ESPN+ will be available in English and Spanish. Former UFC heavyweight champion and multiple-time title challenger Dos Santos (20-5, fighting out of Salvador, Bahia, Brazil) looks for his third win in a row to break back into the top-5. 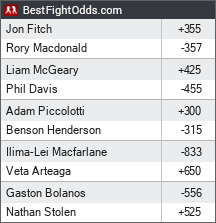 In the headlining spot for the fifth time in a row, and 11th overall, Dos Santos has faced a who’s who of UFC heavyweights, such as Stipe Miocic, Alistair Overeem and Cain Velasquez. Dos Santos is now poised to earn his fourth shot at the title with another impressive win. Tickets for UFC FIGHT NIGHT ON ESPN+®: LEWIS vs. DOS SANTOS go on sale Friday, Jan. 18 at 10 a.m. CT/11 a.m. ET and are priced at $125, $100, $85 and $75 (not including fees). Tickets are available for purchase online at selectaseat.com, by phone at 855-755-SEAT (7328) or in person at the Select-A-Seat Box Office at INTRUST Bank Arena. Ticket sales are limited to eight (8) per person. UFC Fight Club® members will have the opportunity to purchase tickets Wednesday, Jan. 16 at 10 a.m. CT/11 a.m. ET via the website www.ufcfightclub.com. A special Internet ticket pre-sale will be available to UFC newsletter subscribers Thursday, Jan. 17 starting at 10 a.m. CT/11 a.m. ET. To access this presale, users must register for the UFC newsletter through UFC.com.